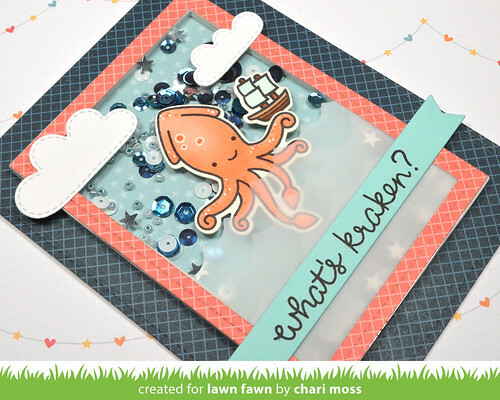 For today's card I used the Nautical Sparkle shaker mix to create a fun card with the Kraken from Lovable Legends. I used papers from the Pint Sized Patterns Beachside collection to create this card and stick with the nautical feel. I colored the Kraken from Lovable Legends in peachy orange copic colors to stand out from the various blue papers and blue shaker mix. I layered three layers of die cut vellum waves over the shaker box so that the pieces inside could "hide" in the bottom when the card is upright, sort of like a fun surprise when you shake the card. I used the new sentiment banner die and new Mermaid cardstock for the sentiment and finished off with some white clouds to finish off the little scene. Be sure to check out the Lawn Fawn blog all week for more projects with Lucy's fun and beauiful shaker mixes! Oh WOW - this is FABULOUS!!!!! LOL, so cute Chari. Just precious! The title of the best Forex trading robot is not something that I would consider throwing around lightly, especially considering that there are precious few Forex robot traders out there that actually work. By the end of this article, you will be able to make up your own mind about whether the Forex Morning Trade System is the best Forex trading robot for you. Chari, this card is AMAZING!!! Every single detail is absolutely perfect! Love love love it!!!! I just love this card SO much Chari!! So fun!